When China opened the ancient Maritime Silk Road, the famous navigator Zheng He’s voyage led a fleet of much more 170 ships, crossed the Indian Ocean,reached as far as the Red Sea and the east coast of Africa, arrived the twice commercial developed Mogadishu, Chinese businessmen brought tea and daily necessities. This is the earliest exchanges in the culture and trad between China and Somalia along the ancient Maritime Silk Road. Indeed, Chinese and Somali people are linked together by the ancient Maritime Silk Road, today’s Maritime Silk Road is a new chapter in the friendship between the two peoples. Qin Jian: Yes, China firmly supports peace and development in Somalia. China has supported the restoration of peace and reconstruction in Somalia bilaterally and multilaterally. We have actively provided humanitarian assistance to Somalia, such as food, nutrition, tents, mosquito nets and emergency relief cash assistance. Among them, we provided 72 containers of material assistance last year, including 500 water tank, 10,000 mosquito nets and 30,000 tents. We have provided USD20 million worth of food aid to women, children, IDPs and returning refugees in Somalia. We have helped Somalia develop its human resources and actively provided Chinese government scholarships to Somalia. I arrived in Somalia in 2017 to perform my duties, China has provided its government scholarships to Somalia for more then three years, recruiting students from various federal states in Somalia. As we all know, the development of a country depends on valuable talents, and the cultivation of talents depends on education. China provides first-class universities in China to young Somali students to train talents for Somali national development. At present, Somali students are studying in more than 30 universities in China’s cities. They feel the deep feelings of the Chinese people towards Somalia, meanwhile, they bring Somali culture, and they have become envoys of civil friendship to spread. China stands ready to work with other international partners to support Africa in pursuing peace and development. China welcomes and supports all initiatives that meet Africa’s interests, and believes that it should be the same with the wider international community.China is the world’s largest developing country, and Africa is the continent with the largest number of developing countries. In 2018, China-Africa trade amounted to US$204 billion, China’s investment stock in Africa has exceeded US$110 billion, China-Africa trade has increased by 20% , and Africa’s exports to China have increased by 30%, China has become the fastest growing market for Africa’s exports. Africa’s debt issue is relics of a long history, it does not appear today, nor is it caused by China, for example, Somalia’s debt issue. To solve Africa’s debt issue, Africa should realize its economic independent development and sustainable development as soon as possible. “It’s better to teach people fishing than to give them fishes”. Africa’s industrialization has entered the third decade, and the first two decades had not been completed successfully by some western countries. China is willing to strengthen cooperation with African countries and take the third decade to promote successful industrialization in Africa, and work with Africa to achieve our shared goal of building a closer China-Africa community with a shared future. Guided by Xi Jinping’s Diplomatic Thought, we do not interfere in the internal affairs of other countries, nor impose our own development path and ideology on others. We are willing to share our experience and ideas of governance and development with Somalia. Today I brought “XI JINPING: THE GOVERNANCE OF CHINA”, after you read it, you will know about China. Now many countries in the world are studying China’s political system and path, they are researching the experience of the ruling leadership of the CPC. Yes, under the strong leadership of the CPC, we have build a poor China into the second largest economy in the world. Did you know that when China implemented the reform and opening-up policy in 1978, its per capita income was just over USD500, and today’s per capita income is USD10000! It is a miracle in the history of world development that a large country with a population of 1.3 billion has made great strides that have truly impressed the world under the strong leadership of the CPC. Somalia is a country with a glorious history with its culture, language and development, vast territory and rich resources. Recently, the Somali Ministerial Council adopted on the Strategy and National Reconciliation Plan that determined by the inclusive politics road-map of the federal government to achieve peace and development. We support the national reconciliation of Somalia, and believe that under the leadership of the Somali government, the people of Somalia will work together to build their country into a beautiful and prosperous. Qin Jian: China and Somalia are real partners on trade and business. In recent years, trade between our two countries has developed rapidly. Somali businessmen are very active, they have many businesses in neighboring and Middle East countries and other places. Many Somali businessmen go to China’s Yiwu commodity wholesale market to purchase goods and visit to China. 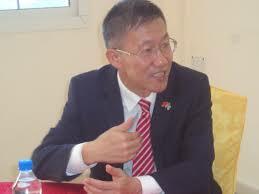 Chinese Embassy in Somalia has made great efforts to provide convenience for them. At present, the annual trade volume between the two countries is estimated at US$100 million. We will strive to expand trade between the two countries. How both countries can strengthen deeply their relations in future? last year, the president of Somalia went to China attending the Beijing Summit of FOCAC. The two countries signed a cooperation document on the Belt and Road Initiative(BRI), opening up a new approaches for the development of bilateral relations. The second Belt and Road Forum for International Cooperation (BRF) will be held in Beijing in April 2019. Two Somali ministers will lead a delegation to China to attend the meeting of the Second BRF. The Belt and Road is an important initiative for international cooperation proposed by President Xi Jinping to enhance both China’s development and its cooperation with global partners. The BRI represents a major breakthrough in both theory and practice, and it carries far-reaching significance.